Posted on 11, February 2019 by EuropaWire PR Editors | This entry was posted in Germany, Industrial, Infrastructure & Utilities, News, Technology, Transportation & Logistics and tagged Circle Line Stage 6, electrification, Michael Peter, mobility, North East Line extension, overhead power lines, public transport, rail electrification, rail electrification system, Rail Enterprise Asset Management System, Siemens Mobility, signaling system, Singapore. Bookmark the permalink. 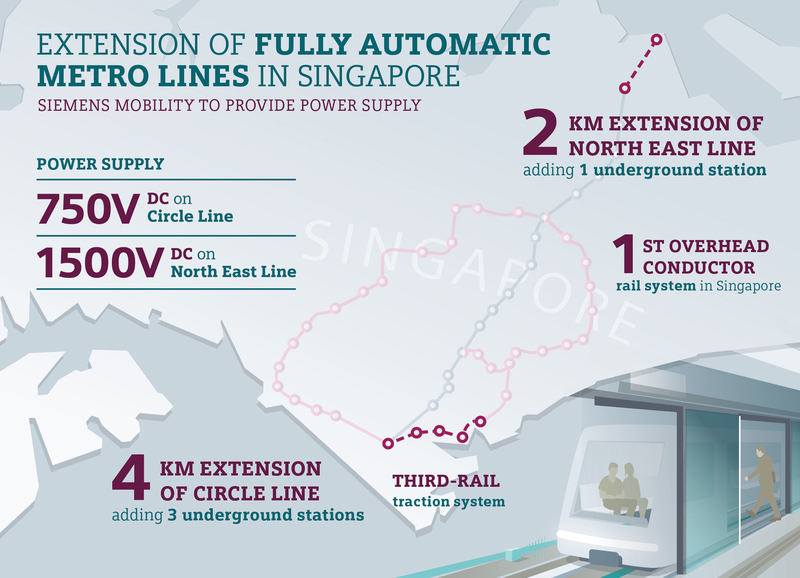 MUNICH, 11-Feb-2019 — /EuropaWire/ — Singapore’s Land Transport Authority appoints Siemens Mobility for the electrification of the Circle Line Stage 6 and the North East Line extension (NELe) in Singapore. The €70 million contract includes delivery of the rail electrification system (direct and alternating current) as well as the overhead power lines for the NELe. Siemens Catenary System Standard Rigid aluminum overhead busbar system will be supplied for this project. Sicat SR has a lower installation height and has a low voltage drop, compared with conventional overhead power lines. The system also has a high current-carrying capacity, short-circuit resistance and reduced contact wire wear. Siemens Mobility had delivered the signaling system for the extension of the Downtown Line 3 in March 2018 and a Rail Enterprise Asset Management System supply order followed in September 2018. Siemens Mobility is the leader in transport solutions been active for more than 160 years. Key areas for the company are rolling stock, rail automation and electrification, turnkey systems, intelligent traffic systems as well as related services. The company, which is run separately from Siemens AG, had €8.8 billion revenues and around 28,400 employees worldwide as of FY 2018, which ended on September 30, 2018. KeolisAmey unveils plans for the Wales and Borders rail network and the development of the South Wales Metro in partnership with Transport for Wales – The announcement came as the Welsh Government confirmed that KeolisAmey would be the next operator and development partner for the network, following the end of a 10-day standstill period in the procurement process….